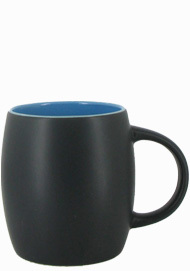 14 oz Robusto Two Tone Matte Finish Ceramic Coffee Mugs are one of our best selling ceramic coffee mugs. Generously sized these mugs are a favorite addition to any table setting and with 6 color options to choose from you are sure to find the color that fits your strle. Its Matte black exterior is a hot trendy detail and with the large handle people are sure to "hang on" to these when you use them for gits.